� Indoor – These are required when parked inside the garage. A light car cover can be used for frequent usage with easy on and easy off; heavier material, if it is parked in a garage which sees a lot of movement of children, pets etc. to protect it from bumps and dents and if it is not taken out too often. In addition, they should be mildew resistant. � Outdoor – These are usually waterproof, high strength polyester fabrics that are built in with special polymers to shed dust, bird droppings, pollutants, water and tree sap. They are also UV resistant and breathable, allowing any heat or moisture trapped between the car and the car cover to escape easily. � Universal car covers – These are low quality one size fits all cars which are baggy, allowing the harsh elements in defeating the very purpose of a car cover. They also tend to rub against the paintwork. � They can be used to seal your vehicle in for extended periods, much like a giant ziplock bag for added protection. If your car is a light color, it is best to go for a light colored ones. Light colored materials are also recommended for sunnier climates. If you are looking for style you could go for a vibrant color. They are basically made from polyester and microfiber, with additions like flannel dinners, etc. For cars about to be launched, silky polyester that just drapes over the car, outlining its silhouette is available. Most are ultrasonically laminated, making them dust proof while remaining breathable and soft against any fine paint finish. They are also designed for easy storage. 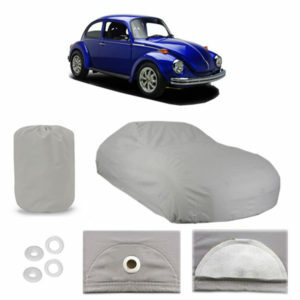 How to buy a car cover? Most sellers have an index of the car manufacturers and their model names. All the customer has to do is indicate the model of his car. With the full description of the product and easy and secure payment portals available on the website, delivery is guaranteed. There is also a toll free helpline number should the person have any query. What are the assurances that a customer should look for? carcover.com is rated as the #1 car cover company in the United States of America. Their only goal is to provide maximum safety for their customer with their car covers. Part of the reason Classic Cars Online US exists is to help connect classic car buyers and sellers, and we’ve added several ways for you to connect – pick your favorite, or join us in all four places: (1) sign up on the Classifieds page here on the site, (2) visit and like this site’s Facebook page, (3) the Best Classic Cars for Sale page or (4) join the Classic Cars Online: Classic Cars for Sale group if you are looking to buy or sell vintage automobiles and accessories.